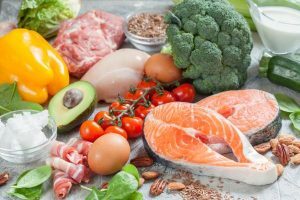 In part one of this series, we looked at whether the ketogenic diet is right for you, and the medical issues you may suffer from that should be considered showstoppers. In this part, we’ll look at foods you can include as part of your new diet. There are several forms of the ketogenic diet. While the standard diet remains fixed in its ratios of fats to carbs, other versions can vary these. The targeted diet, for example, boosts carbs during workouts. We’ll look here only at the standard keto diet, which aims at eating no more than 20-50 grams of carbs a day. Typically a keto diet includes 70 to 75 percent fat, 15 to 20 percent protein, and 5 to 10 percent carbohydrates. So what foods fit each category? Seeds And Nuts: these are healthy and provide a good supply of healthy fats. Avocados: the avocado is considered a superfood in some circles. It supplies healthy, valuable fats. Butter: Real butter, not margarine, is rich in fats. Of course, those with lactose intolerance will have to forgo it, but ghee can be a good alternative for them. Coconut Oil: Coconut oil is valuable as a cooking oil and can even be used as a butter substitute. Fish With Omega-3s: Fish provides valuable omega-3 fatty acids. The second part of the keto diet is low-carbohydrate foods. Here is a good starting list. Of course, you aren’t limited to these. A bit of research will let you add to this list. Dark leafy greens: This includes arugula, chard, cabbage, endive, and beet greens. Low-carb vegetables: Not all vegetables are low in carbohydrates. Some that are include artichokes, asparagus, broccoli, cauliflower, celery, and cucumbers. Garlic, mushrooms, and snow peas are also low in carbs. Most “above ground” vegetables work for a keto diet, but most “below ground” ones such as root vegetables are too high in carbs. Fruits. As with vegetables, not all fruits are low in carbs. Here are a few you can count on (in reasonable quantities) for the low-carb portion of your diet: blackberries, coconuts, strawberries, lemons, and olives. Spinach. Yes, Popeye’s favorite food is loaded with protein. One cup contains as much as five grams. Sun-dried tomatoes. These deliver about six grams of protein. Bison. Bison meat is rich in protein. Four ounces delivers over 20 grams, while including less than 170 calories — less than most soft drinks. Look for organic bison. More and more farms are providing meat of this quality in organic form. Pork. Pork supplies almost 25 grams of protein with less than 125 calories. Of course, it is important to consult a physician before embarking on any new diet, exercise, or weight loss program. Whatever your goals, consult your medical practitioner for advice. As you can see from the list above, tackling the ketogenic diet doesn’t mean giving up well-rounded meals. The diet doesn’t focus on specific foods but on specific types of foods. The ketogenic diet is not based on limiting your choices, but on managing a range of choices. We recommend you check out the ketogenic diet plan on the dietdoctor website to get started. The keto diet, like any low-carb diet, can have significant health benefits. If your goal ultimately is weight loss or dropping visceral fat, the ketogenic diet may be a perfect fit.